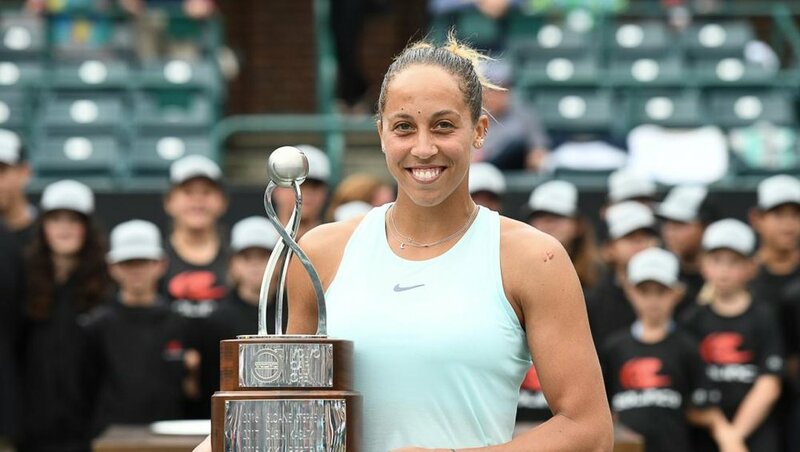 Madison Keys is all smiles after defeating Caroline Wozniacki 7-6(5), 6-3 of Denmark on the WTA Tour in the conclusion of the Volvo Car Open in Charleston, SC this past weekend. Keys had an impressive run to get to the final, beating two Grand Slam Champions in Sloane Stephens and Jelena Ostapenko, as well as reigning Olympic champion Monica Puig. She would have a final challenge ahead of her in Wozniacki, who is a Grand Slam winner herself. Wozniacki was playing in her third Charleston final, having finished as a runner-up in 2009 and winning the title two years later. The former world No. 1 is the winningest player on tour in Charleston and was looking to add another title to her impressive record. In the end, Keys was too much for Wozniacki as she overpowered the player from Denmark. Keys, who hit an overwhelming 54 winners, now has her fourth title of her professional career with the win and improves her overall record at the tournament to 16-6. "Every time I come here I feel like I'm home," an emotional Keys said on court. "The support I have from everyone in the stands means the world to me." Not only does Keys gain a trophy and a brand new Volvo as the winner of the Volvo Car Open, her success lifts her back into the Top 15 women players in the world for the first time since last August. To read more about some of the other key rankings changes following this and other tournaments from this past week click here . To see highlights from the Volvo Final click below. Older PostFrom the Brink of Retirement!